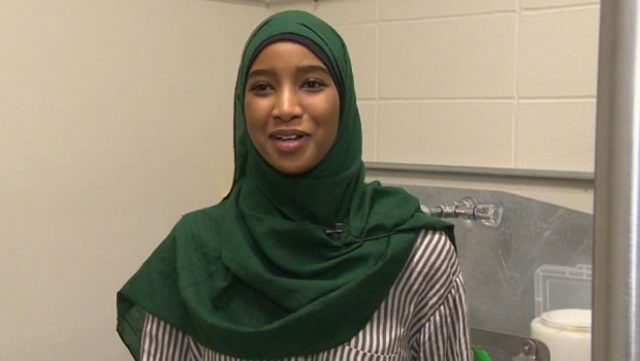 Hamdi Ali, a 17-year-old Muslim high school student from Edmonton, Canada, became famous overnight after she discovered a new way to extract rough diamonds from rock without using the current method of mechanical crushing. Ali is a participant in the University of Alberta’s WISEST Summer Research Programme, which is designed to encourage women to explore different scientific fields and get the chance to spend six weeks of their summer doing research at the university. She discovered a new use for a machine on campus called SELFRAG. The machine sends about 200,000 volts of energy into a rock, destroying it, which enables the recovery of diamonds that would have been crushed if established extraction methods had been used. Ali’s research was conducted under the supervision of Graham Pearson, a science professor and mantle geochemist, and Margo Regier, a graduate student studying geology and diamond-related research. Diamonds are usually extracted by crushing rock samples and sifting through the resulting debris. Ali’s research was to explore how a new tool, the SELFRAG lab system, could help electrically separate the diamonds and allow them to be recovered with slightly less damage than can occur in the traditional crushing method. The results were more than slightly promising and clear even from the first test. “The first experiment that Hamdi did with the SELFRAG machine was astonishing,” said Pearson.